Here at Stitches, we pride ourselves on offering all types of embroidered items. By working with only the best apparel providers, we are able to offer quality embroidered items, in most cases, that are no more expensive that a standard item you would buy in a big box store or clothing outlet. While it would be impossible to list everything that we provide, the following are the most requested items. Please see our online catalog for a full list of styles, sizes and colors available. If you do not see what you are looking for, PLEASE CALL US! We are always in the process of updating our available items! We are also glad to embroider items that you already have. 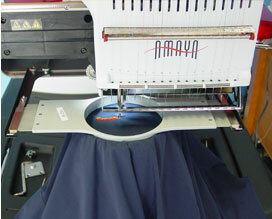 Many customers already have an item that they like that they want to customize and Stitches can handle that no problem. We have embroidered everything from tablecloths to travel bags to leather jackets!